Every, J.L.R. (2009). Neotropical Haloragaceae. Herbs, perennial or rarely annual (Myriophyllum L.), aquatic or amphibious, not free -floating, with adventitious nodal roots , exstipulate , with 1(-3) deciduous pseudostipules (hydathodes) present in leaf axils of Myriophyllum. 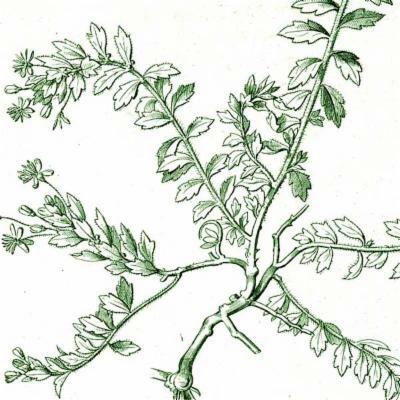 Leaves heterophyllous (Proserpinaca L. and Myriophyllum), with submerged and emergent leaves differing, opposite, alternate , spiraling or whorled , entire or finely pinnately dissected , sometimes serrate and simple , shortly petiolate , subsessile or sessile . 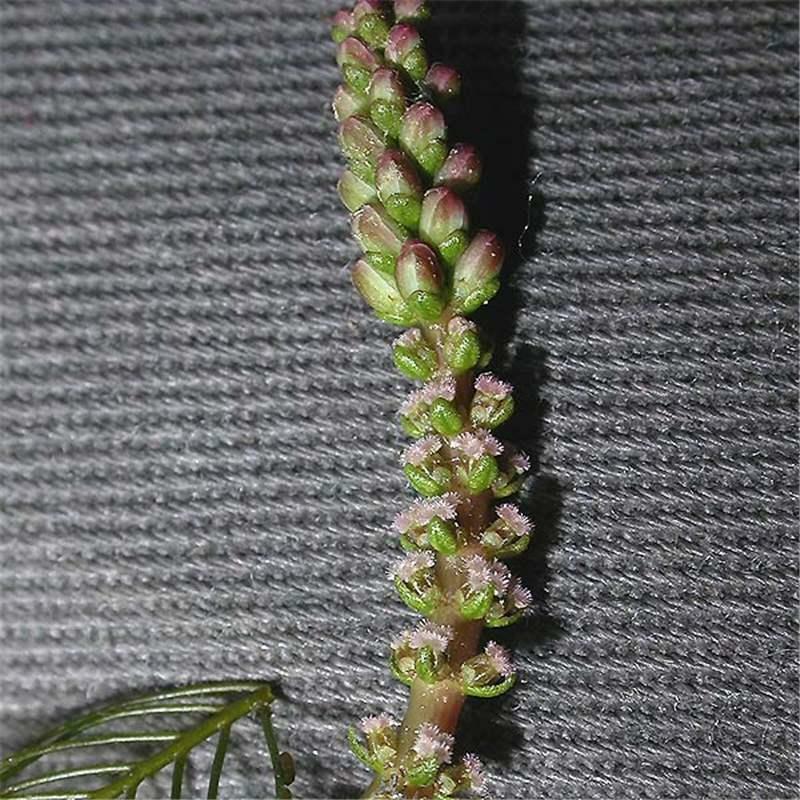 Inflorescence axillary , thyrses lacking terminal flowers (Proserpinaca) or racemes with female flowers in lower part and males in the upper (Myriophyllum) or 1-11-flowered fascicles, sometimes of either bisexual and female flowers or made up of both male and female (Laurembergia P. J. Bergius); bracteoles 2. 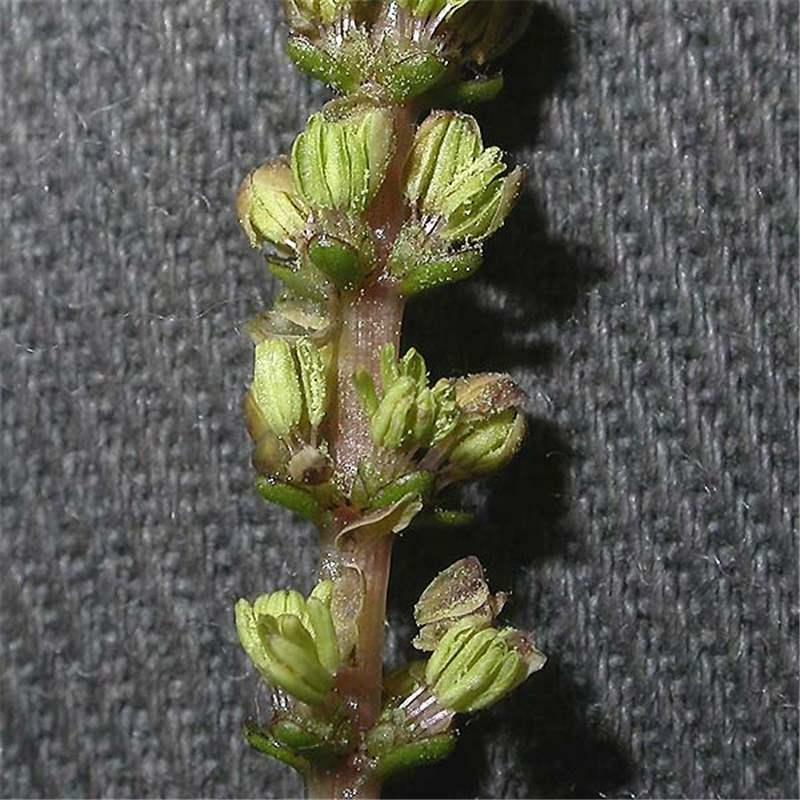 Flowers, very small, actinomorphic , hermaphroditic, polygamous or unisexual and monoecious , epigynous , (2-)4- merous or 3- merous (Proserpinaca) sessile or pedicillate; sepals valvate , forming a tube, persistent (mostly absent in female Myriophyllum; petals absent or rudimentary and free , imbricate ; stamens (1-)4 or 8 (3 in Proserpinaca), filaments short, slender; anthers basifixed, dehiscing by slits; gynoecium (-2)4-carpellate; ovary inferior (-1)4-locular, sometimes becoming unilocular (Laurembergia), stylodia 1 per carpel , feathery, stigma capitate . Fruit non- fleshy , indehiscent or an ornamented schizocarp . Seeds 1-3. Centre of diversity in Australia with c. 60% of species (Moody 2007). Three Neotropical genera grow in slow moving water or in marshy, littoral habitats. 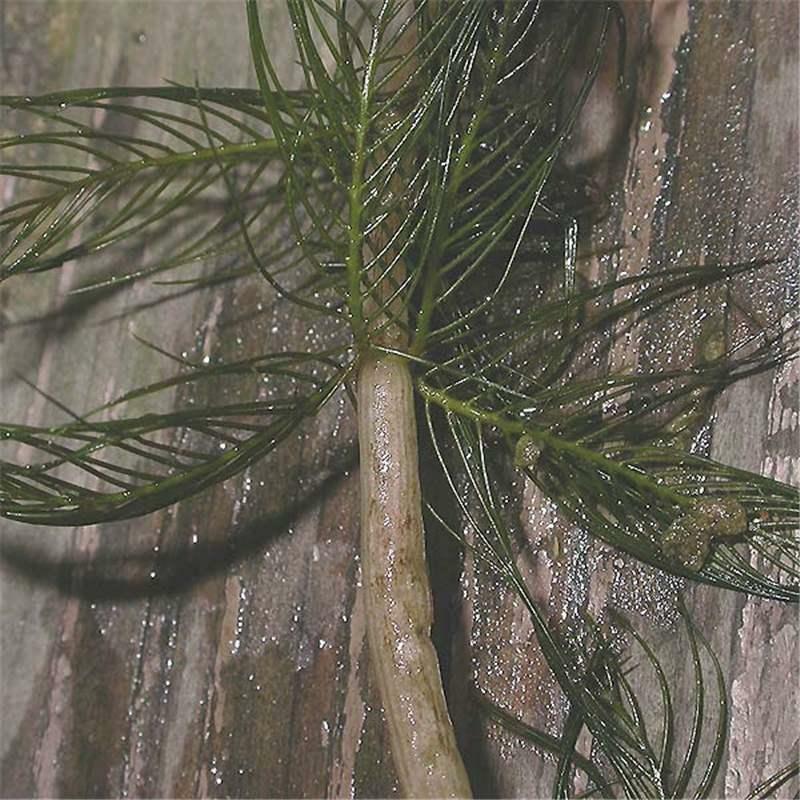 Some species are found at greater than 3,000 m.
Myriophyllum is the most speciose genus of the family and has a cosmopolitan distribution and can be found in eastern South America, the West Indies and Central America. Proserpinaca has c. 3 species and occurs from North America through Mexico into Guatemala and the West Indies. Laurembergia is a pantropical genus (excluding Australia) with c. 4 spp. and widespread in the Neotropics particularly eastern South America. Small flowers with radial symmetry. Anthers basifixed, dehiscing by longitudinal slits. 2 bracteoles subtending the flower, occasionally caducous. Petals yellow, blue-green or red-purple. Gunneraceae: petiolate (often long), zygomorphic flowers, fleshydrupaceous fruits or leathery dehiscent fruits. Tertracarpaeaceae: superiorovary, free carpels, many seeds, endemic to Tasmania. Inflorescence solitary or in dichasia of up to 3 flowers per axil. Sepals less than half the length of the petals (frequently absent). Fruit schizocarpic, ornamented and splitting at maturity into 2-4 mericarps. Leaves subwhorled, opposite or alternate, not heterophyllous. 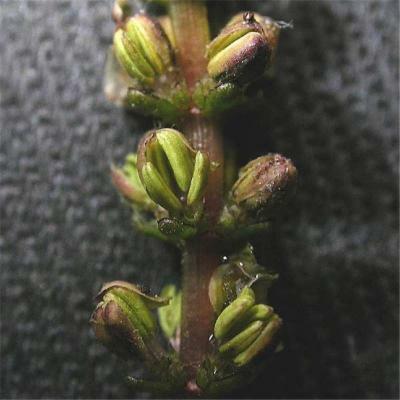 Flowers unisexual in dichasia, the distal positions occupied by male or hermaphroditic flowers which stand out on a long pedicel from the almost sessile female flowers. 8 stamens in 2 whorls with the outer fertile whorl alternating with the sepals. The ovary initially 4-loculate, becoming 1-4-loculate through the collapse of the columella. One-seeded fruit with variable structure. Myriophyllum aquticum (Vell.) Verdc. and M. spicatum L. are invasive weeds. Cultivated in aquaria and sometimes as pond plants. Three Neotropical representatives of the eight mainly antipodean genera. Sister to the monogeneric Penthoraceae which does not occur in the Neotropics (Stevens, 2001 onwards). Placed within the Saxifragales (APG2, 2003). Removed from the Myrtales by Takhtajan (1997). APG 2. 2003. An update of the Angiosperm Phylogeny Group classification for the orders and families of flowering plants. Botanical Journal of the Linnean Society. 141: 399-436. Brummitt, R.K. In Heywood, V.H., Brummitt, R.K., Culham, A. and Seberg, O. (eds). 2007. Flowering Plant Families of the World, pp. 162-3. Royal Botanic Gardens, Kew, Richmond. Kubitzki, K. 2007. Haloragaceae. In: Kubitzki, K. (ed.). Families and genera of vascular plants. Volume 9. Flowering plants. Eudicots.pp.185-190. Springer-Verlag, Berlin. Maas, P.J.M. & Westra, L.Y. Th. 2005. Neotropical Plant Families. 3rd ed, p.148. A.R.G. Gantner Verlag K.G., Ruggell. Mabberley, D. J. 2008. Mabberley's Plant-book. 3rd ed. p. 387 Cambridge University Press, Cambridge. Moody, M. L. & Les, D. H. 2007. Phylogenetic systematics and character evolution in the angiosperm family Haloragaceae. American Journal of Botany 94(12): 2005-2025. Orchard, A. E. 1981. 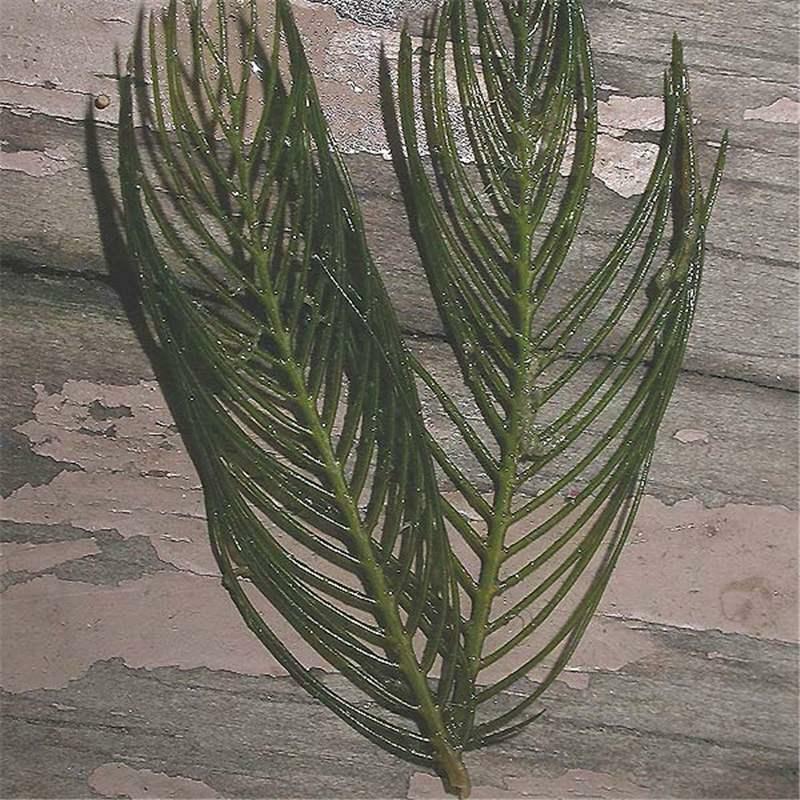 A revision of South American Myriophyllum (Haloragaceae), and its repercussions on some Australian and North American species. Brunonia 41: 27-65. Smith, N. & Stevenson, D.W. 2004. Haloragaceae. In: Smith, N., Mori, S.A., Henderson, A., Stevenson, D.W. and Heald, S.V. (eds). Flowering Plants of the Neotropics. pp.178-179. The New York Botanical Garden, Princeton University Press, Princeton. Stevens, P.F. 2008. Angiosperm Phylogeny Website. Version 9 onwards. http://www.mobot.org/MOBOT/research/APweb/. Takhtajan, A. 1997. Diversity and Classification of Flowering Plants. Columbia University Press, New York. Watson, L. & Dallwitz, M.J. (1992 onwards). The Families of Flowering Plants: Descriptions, Illustrations, Identification, and Information Retrieval. Version 3rd March 2009. http://delta-intkey.com.